In the early 1980s, UBC Mechanical Engineering Professor Philip Hill turned his attention toward natural gas as a cleaner burning alternative fuel for diesel engines. His intent was to reduce emissions of nitrogen oxides and particulate matter, which are harmful to human health and the environment, while retaining the performance, fuel economy, durability, and reliability of the diesel engine. Operating on a shoestring budget, Professor Hill and his team of graduate students and research engineers designed and built their own components and equipment, focusing on an innovative method of fuel injection. 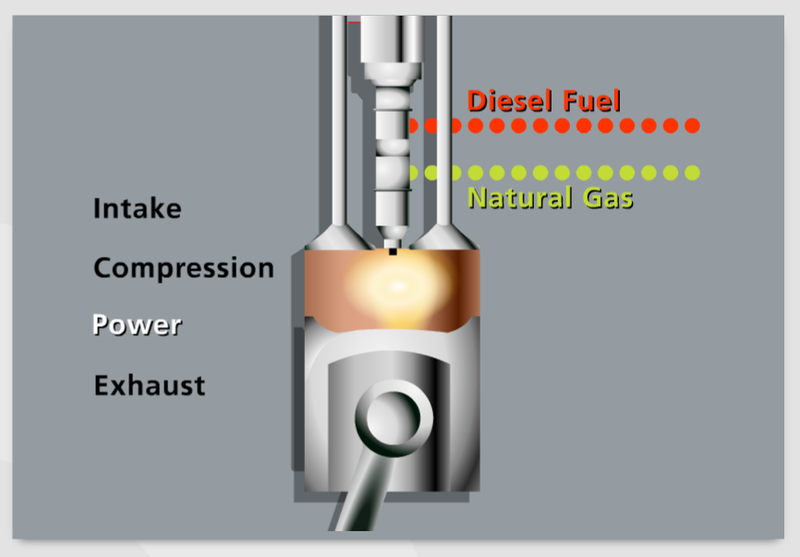 By injecting a small amount of diesel fuel as a “liquid sparkplug” followed by a main injection of high-pressure natural gas, the team was able to initiate combustion and retain the desirable characteristics of the diesel engine, while running it on natural gas. This double injection took place within a single injector, and became the basis of Westport’s international success. The Westport fuel injection system injects a small amount of diesel fuel into the cylinder as a “liquid spark plug” before the main injection of natural gas. In 1994, UBC’s University-Industry Liaison Office introduced the now CEO of Westport Innovations Inc., David Demers, to Professor Hill. One year later, Westport Innovations Inc. was formed to commercialize Hill’s innovative fuel injection technology. In due course, major players in the diesel engine manufacturing sector took notice, and in 2001, Westport and Cummins Inc. formed a joint venture, Cummins Westport Inc., to adapt the technology for the Cummins heavy-duty truck engine. By 2015, Cummins Westport had over 28,000 medium- and heavy-duty natural gas vehicle engines in service worldwide. A number of joint ventures, partnerships, and acquisitions followed that have dramatically expanded the use of Westport’s fuel injection technology. The company now sells natural gas and propane engines, fuel systems, and components to Fiat, Volkswagen, Tata Motors, the GAZ Group, Chrysler, General Motors, Ford, PACCAR Inc., Volvo, Hyundai and Kia, and to aftermarket customers in over 79 countries. Westport also has an LNG locomotive program in development. Westport is an international success story on several different fronts. As well as being commercially successful, Westport’s substitution of natural gas for petroleum-based fuel reduces harmful emissions, such as particulate matter and greenhouse gases, while using a relatively inexpensive and more abundant alternative fuel. Merger with Fuel Systems Solutions, Inc.: On June 1, 2016, Westport Innovations Inc. and Fuel Systems Solutions, Inc. officially merged to create Westport Fuel Systems Inc., a premier, global company for the engineering, manufacturing and supply of alternative fuel systems and components.